SILVER SPRING, Md. — Grab a metal number to be sure no one gets left behind in a tunnel collapse. Clang down a temporary metal staircase behind a Giant supermarket. Pass under the patron saint of miners, St. Barbara. And you’ll find yourself facing the mouth of the only tunnel being excavated as part of the Purple Line. 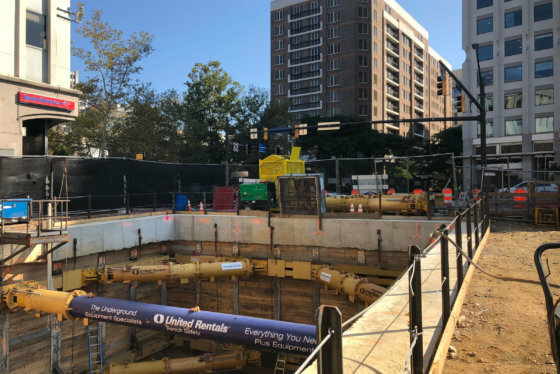 While excavation only began in June, a machine has already dug about 350 feet, one-third of the way into the tunnel — from Arliss Street under Flower Avenue, to Wayne Avenue in Silver Spring. The machine has what looks almost like a double drill bit that spins its teeth on the front of what otherwise looks like a yellow backhoe. The machine works 4 feet at a time on each eight-hour shift, with workers putting up rebar and spraying special concrete behind it to hold the tunnel in place. That makes for progress of 12 feet each day. An engineer was keeping a close eye on the work Wednesday as she surveyed the direction of the tunnel, the amount of concrete being used and the form of the materials framing the tunnel wall. For now, the excavation is digging a tunnel about 20 feet high and 40 feet wide. After the tunnel breaks through at the other end, crews will go back through to dig another 10 feet or so down so that there is room for the concrete slab that will eventually hold the tracks. All work on the tunnel, including the tracks, is scheduled to be finished in 2021, which would keep the project on track to open in 2022. The tunnel is as deep as 80 feet underground. Excavation could be fully completed by the middle of next year or sooner. It will first break through in three to four months, though, into the eastern side of the Manchester Place Station, which is being built between two apartment buildings off Wayne Avenue and Plymouth Street, not far from Sligo Creek Parkway. Purple Line Transit Partners, the private group building and operating the line for the Maryland Transit Administration, has promised to carefully monitor for vibrations in the homes above the tunnel, settlement, changes to groundwater and any ground movement in the neighborhood. So far, the project has not seen any significant changes due to the tunneling work. The tunnel is below the water table, so sump pumps are in place to get rid of water coming in through drainage holes drilled to relieve pressure. The water is pumped into a settlement tank to remove solids, before the treated water is put into a storm drain. “Once we’re done with the tunnel, we’re going to put a waterproofing membrane all around,” Purple Line tunneling manager Jean-Marc Wehrli said. The drain holes will be sealed, and a permanent liner will be added with the goal of keeping the tunnel completely dry. Even in the tunnel, the Purple Line trains will be powered by overhead lines. The 16-mile, 21-stop light rail line will connect to Metrorail at four stations, but is being built and operated independently of the Metro system.